Right now, I'm in the midst of packing to move. A huge proportion of my possessions are books, even in this electronic era, and those are mostly packed. Still, those are what makes this more of a trial than it needs to be. I moved to this apartment when my marriage ended, four years ago. Now I'm buying my ex-wife out and moving back to the house, and she is moving to her own apartment. Don't ask me if this is a wise financial decision. There is a lot of sentiment involved, perhaps a bit too much. Interestingly, though I am moving from an apartment to a house, the quality of my writing area will decrease. Right now my office is a weatherized porch on the second floor, just off the kitchen. It's a smallish room with good light, and just enough room for my desk, a table for the printer, and a bookshelf. More of my books. Not my worst habit. The house has no real space for a separate office. I'm not ready to confiscate a bedroom from one of my two kids, even though one of them is off at college. So it will either be back to the basement, where I worked for so many years, or in a space in the dining room. My dining room gets more use than some, because I like having people over, but maybe I'll turn the space into a hybrid library/office/dining room. 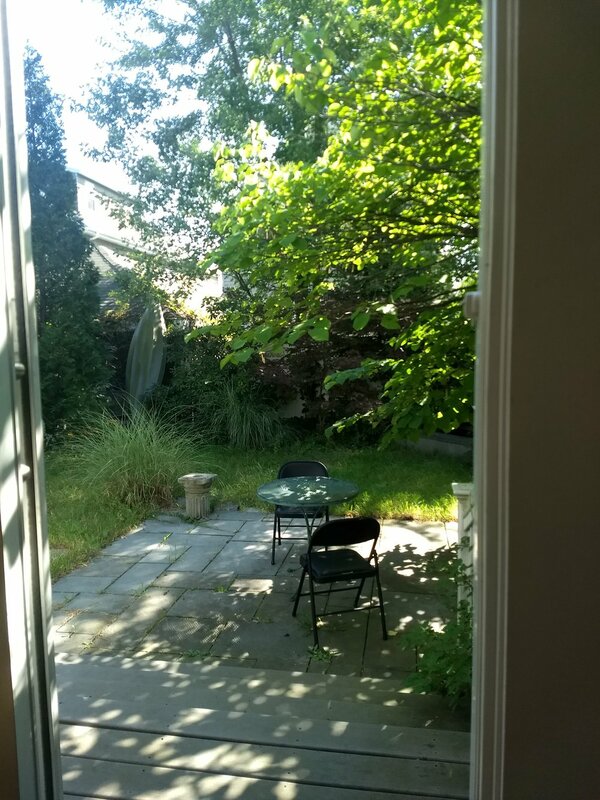 It does have a nice sliding glass door opening out on my garden, which is currently an overgrown mess. Bringing that thing back to life is my first goal. I used to have a big garden party in the late summer for all of my writer and writing associated friends. My then-wife never liked it, and I missed a couple, and then moved out. I don't know if I can manage to schedule one before the weather cools down and gets too unpredictable. This is what passes for exciting news in the life of a writer! Packing. Dismantling things. Fretting about where the moving truck is going to park. Yeah, you have no idea. I've been a member of the same peer speculative fiction writing workshop for decades now. In addition to the usual stories and novels, we've commented on plays intended for the stage, plays intended for historic sites, essays, and other forms of prose. For many people, insomnia involves not being able to get to sleep. Mine, when it manifests is in the form of early morning awakening. Its incidence comes in waves. Sometimes I have no problem for weeks at a time. Then there will be a period when I do wake up at 3 am or so, but fall back asleep almost immediately. Then comes a period, such as the one I'm going through now, when I wake up at 4 or 4:30 am or so. My usual wake time is 5:30. So, this week, I've been hitting the writing chair way early. That can be great--I can get my fiction stint in, then turn to client work, and not have a time crunch later in the day when exercise bumps up against other required tasks. But sometimes it also gives me an excuse not to work. "I have an extra couple of hours!" I, for some reason, say. "That means I deserve to goof off." It doesn't help that self-control is lessened when I haven't had enough sleep--and willpower is not something I have an oversupply of to begin with. I do have a project I want to get done before I go on vacation (a revision of a novel about my detective, Sere Glagolit), so today, Saturday, I've been working since about 5. And I'm ready to take a break! So, using the time makes it valuable, giving in to temptation and goofing off makes it a curse. You might think that decision would be easy.... But if you are realistic, you know how hard it is. "So, how's the novel going?" Writers aren't exceptionally mean, even to other writers, but it does somehow seem that way, because of the way we leave our egos exposed. No wonder others are tempted to at least give them a good swift kick now and again. "How's the novel going?" (unless you know the writer is a demon of productivity, in which case there are other ways of getting their goat) is one of the great questions. It seems to come out of genuine interest, maybe really does come out of genuine interest, but a certain passive aggressiveness that leads, when deployed appropriately, to dismay, depression, and defensiveness. Well played! Yeah, I asked a couple of people that at Readercon. You may ask why, if we treat each other so badly do we hang out with each other? First, it's because many of us are genuinely entertaining, at least to each other. Second, by the same token, no one else finds us as entertaining as we do. And I did have a great time last weekend, and had to take a long nap the day after to recover. Last week I did a guest author stint at the great Odyssey Writing Workshop, held at Saint Anselm College in Manchester, NH. Odyssey is kind of a bootcamp for people honing their skills in all areas of fantastic fiction. For six weeks, 16 writers write, read, think about, discuss, eat, and sleep fantastic fiction, under the stern yet kind direction of Jeanne Cavelos, who created the enterprise. I envy them. I never did anything like this earlier in my career, which might really have helped. Jeanne likes to have a writer or editor come in every week, to talk about the writer's life, and help critique varius students' work. Since writing is very much a part-time enterprise for me, which I anticipate for most of the students, I focused on how to manage that, and what to expect. I'm not a writing teacher. It's just not a topic where I think I have an enormous amount to add. And it takes me forever to come up with something useful or interesting to say. This year my topic was literary SF, which is just crazy as a topic. Usually I do plot, which I can kind of fake. But it was kind of fun researching, thinking about how literary fiction differs from commercial fiction, what writers should pay attention to, and how to have fun with it. After a couple of weeks drafting my lecture, writing critiques of a bunch of manuscripts, giving my lecture, having individual conferences with students, and in general talking about writing for a day and a half, I was exhausted. I came home and slept much of the weekend. Jeanne does this all day every day for the entire session. It's really her baby, she knows everyone is depending on her, and she is enormously present for everyone at all times. I just can't fathom it. This is about as much instructing as I can manage with my limited energy and even more limited neurons, but I do enjoy it, and end up meeting a lot of interesting people. I worked with some fine writers, and hope to see them in print soon. 8:00 PM 5 How to Moderate a Panel. Alex Jablokow, Victoria Janssen (leader), Kathleen Jennings, Tom Purdom, Kenneth Schneyer. The moderator plays a crucial role in making panels run smoothly and enjoyably for participants and attendees. This panel will cover how to get questions rather than comments from audience members, how to deal with a panelist who goes off the rails, and how to make sure everyone gets equal time, among many other topics. 3:00 PM AT Autographs. Alex Jablokow, Yoon Lee. 6:00 PM C The Catastrophe of Success. Alex Jablokow, Jim Kelly (leader), Matt Kressel, Paul Levinson, Eric Schaller. In a 1947 essay called "The Catastrophe of Success," Tennessee Williams wrote, "We are like a man who has bought up a great amount of equipment for a camping trip... but who now, when all the preparations and the provisions are piled expertly together, is suddenly too timid to set out on the journey.... Our great technology is a God-given chance for adventure and for progress which we are afraid to attempt." This is a very 1940s SFnal way of looking at technology and the world. We are in Williams's future, with 70 years of perspective to add to his still-relevant observation. What has changed in the human relationship to technology since 1947, and what has stayed the same? How can present-day SF explore this tension between what technology allows us to do and the fear that holds us back? 2:00 PM 5 The Life Cycle of Political SF. Dennis Danvers, Alex Jablokow, Barbara Krasnoff (moderator), Sabrina Vourvoulias, T. X. Watson. SF writers have often written deeply political books and stories; some stand the test of time, while others become dated very quickly. John Brunner's Stand on Zanzibar, Octavia Butler's Kindred, Joanna Russ's The Female Man, and Ursula K. Le Guin's "The New Atlantis," to name just a few, directly addressed major issues of their day and are still relevant now—but differently. What affects how political SF ages and is read decades after its publication? What are today’s explicitly political books, and how do we expect them to resonate decades in the future? A few months ago I listened to Tyler Cowen's conversation with Fuchsia Dunlop on his podcast, Conversations with Tyler. The conversation takes place over dinner and includes one of my favorite economics/food bloggers, Megan McArdle as well as Ezra Klein and several other interesting people. Well worth a listen. It makes me realize how often I'm just not paying attention to my food. The podcast led me to purchase Dunlop's book Every Grain of Rice, subtitled Simple Chinese Home Cooking, also recommended. I don't usually read cookbooks, but this one has interesting information about Chinese food, its history--and its ingredients. Here I discovered fermented bean curd. It comes in at least two varieties: red and white. Her main recipe is for spinach, but I went online and found one for cauliflower. I popped down down to H-Mart in Central Square and grabbed some Laoganma brand (people seem to love The Godmother, and the somewhat mournful lady on the logo was allegedly a real person). I bought a lot of other stuff too. It's a great market, though the one out in Burlington is way bigger, almost intimidatingly so. I think I prefer the red to the white, but both are good. Salty and full of umami, the cubes are kind of cheese-like, and melt into the vegetables, giving them a distinct tang. I've never even been a huge fan of cauliflower, but the simple dish above is now in regular rotation, because it's so damn fast, easy to make, and delicious. Anyway, its now a staple here. Give it a try. Am I too lazy to get outraged? Reply All is one of my favorite podcasts because it entertainingly explains all sorts of internet memetic activity in a way that even someone my age can appreciate. They've long had a segment called Yes Yes No where the boss comes to the two hosts (Alex Goldman and P J Vogt) with a mysterious tweet that he con't figure out, and that always turns out to be a deeply multi-referential deep dive into what the soul of the internet looks like that week. Now, they've added "Why Is Everybody So Mad And Do I Have To Be Mad Also", about figuring out what everyone else is so outraged about online, and then whether that outrage makes sense. Using "also" instead of "too" is a stroke of genius, giving it slight fillip of dorky formality. For me, no, it never makes sense. I don't actually think I'm particularly busy during my day. I do have work to do, things to accomplish, something even something fun to do. But the amount of work is certainly not overwhelming. But no matter how uneventful the day, I don't have enough time in it to generate outrage over something I see online, forward it to others, post it on Facebook, and comment on it. It's not that I don't get exasperated at some of the bits of flotsam that the internet floats into my mind. I have one kid in college and another heading there, so what happened at Middlebury College really did disturb me. So when I have beer or coffee with a friend, I will discuss some of the issues on my mind. Don't worry, I can view with alarm with the best of them, and speak fluent harrumphish. It's just that I prefer to express my outrage in person. And with an good IPA or dark roast. I guess that's it. If I am not consuming a hot or cold beverage with someone else, opinions are just meaningless. Behind on everything, but...catching up? I am the mercy of my internal astrology. I have some decent organizational structures, essential for a basically disorganized person who has a lot of things to get done. But sometimes they work a lot better than other times. For instance, recently, I've been catching up with stuff. I am doing nothing different, making no particular effort, but big chunks of stuff that were hanging around, punks with cigarettes dangling from their lower lips, ominously refusing to leave, have suddenly realized they had somewhere else they needed to be, and have cleared out. I really wish I knew what conjunction or trine or whatever of my interior solar system led to a sudden burst of work. But what then? Some people track things about their lives, like how much they sleep, how many hours they spend in REM, etc. To me, unless that information enables you to make a decision, it's just data, like counting the number of birds that land on a phone line outside your window. I guess if the metaphor of internal planets is accurate, I could plan major life tasks for when they are in the right positions, and invest more effort in my external organizational systems when the planets tell me I'm going to be a useless load. Because I sure don't see any correlation with anything else in my life. These moods of productivity come and go. I figure successful people feel productive a higher percentage of the time than I do. I envy them. I really do feel good when I'm writing well, producing for my clients, paying bills on time, and meeting my personal obligations, all without have to strain and torment myself. I wish I felt that way more. But I guess I'll just have to be satisfied with feeling that way sometimes. Most of us writers need to make money, since few of us make enough from fiction to buy lunch, much less support ourselves (much less support ex-wives, college-attending children, expensive tastes in alcohol, etc.) So we have day jobs. Mine is freelance marketing writing. I really like it, and regularly recommend this line of work to fellow writers with an inclination for it. It involves a lot of the same skills, in addition to the writing part: understanding motivation, creating suspense, leaving things to the imagination. It's also got the feature that your clients can suddenly need what you're working on more than anything. One of my clients suddenly got a lot of pressure to generate a huge amount of marketing content, all at once, and with ridiculously short timelines. So she wrote me an email with lots of caps in it, got me a purchase order, had me invoice, and put me to work. I have no idea why my client's higher ups only figured out they needed this stuff two weeks before it had to be in the hands of the sales team, but if you've ever worked at a large company, particularly one that has recently acquired large numbers of other companies, you know that everyone is barely keeping their heads above water, much less calmly looking ahead a few quarters to see what they'll be needing to get things over the line and make their numbers. On the other hand, if I write fiction, someone will read it, but no one is really breaking my door down for it. So I won't lie: it's nice to be wanted. And, as always, doing high quality work on deadline is the only thing anyone will pay for. Mediocre crap turned in late is somehow not a hot commodity. But the fiction is still the first thing I do in the morning. I just have to give it a bit less time when deadlines loom. And the book is going pretty well. I should write about that at some point.